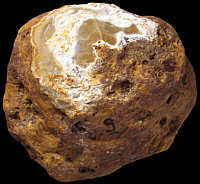 Cortex: Worn and thin, smooth to slightly rough, brownish yellow, transition sharp. Pattern: Flecked (light millimetric inclusions), rare pale spots (unreplaced matrix). Appearance: Poor homogeneity (diaclases, large patches of unreplaced matrix), medium lustre, semi-opaque; moderately smooth, medium grained. Grains: 30%, pale, subangular with high (100-300 µ) to low (1 to 2 mm) sphericity, often surrounded by recrystallization haloes. Grain composition: Mainly thin ramified Cyclostoma bryozoans (section 250 µ), some rare Cheilostoma bryozoans, a few globose (Hedbergella planispira) and biserial planktonic foraminifera, hardly any sponge spicules. 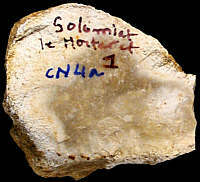 Other types of flint: Besides the Campanian CN4a material, several types of Late Cretaceous material can be found here (CN1a, CN2a, CN2c, CN4b, and CN6), as well as Early Cretaceous Ht3 flint. Other types of flint: Besides the CN4a-type, the CN4c variety can be found here too. 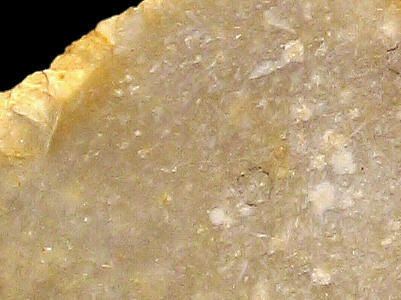 Other types of flint: As so often on secondary sites, quite a lot of other types of flint can be found here, mostly of Late Cretaceous age: CN2b, CN4b, CN4c, as well as the Cenozoic "silex lacustre" of the T1 type. Geographical description: The sampling site is one of a small cluster, together with Les Brovières 2 & 3, which lies approx. 150 metres above the bottom of the valley in a bend of the river Ain, about a kilometre and a half southwest of Poncin, and a kilometre to the north of Chenavel. Geology: The sample consists of surface collected flint from an patch of clays-with-flints, which represent the residue of weathered material of various geological origins (Early and late Cretaceous). 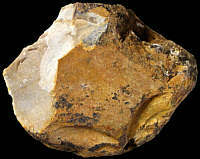 Other types of flint: This is also the only source of CN7 flint sampled until now.